Here at FortyOneTwenty, we love telling stories. Stories are what drive our passion for this craft. Ask anyone in our office though and product geekery would come in a close second. We love our tools. I personally was introduced to the video production world via a particularly geeky tool: remote controlled helicopters. I became very interested in the application of remote operated multi-rotors to the film world. With a camera mounted, these things could achieve amazing production value at a relatively low cost. So, I brought this idea to FortyOneTwenty and away we went, taking to the skies with our cameras. But those were the “old” days (about 3 years ago), back when there were only a few companies realizing the future potential of aerial video and scrambling to provide products to sell, sometimes without proper testing or engineering. It was and can still be a “wild west” environment, so we were very careful about what we bought and how we used it. Our first aerial rig was a garage-built, Frankenstein of carbon fiber, zip ties, circuit boards, servo motors, pulleys and just about everything else under the sun. This monster of a machine was all in pursuit of a seemingly basic task: achieve smooth camera movements while flying through the air. The problem was every little micro movement affected the image. A simple bump from the tooth-based pulley gear could change the horizon level, causing unwanted drift. The constant vibrations from the eight motors would translate into a “jello effect” that made the footage unusable. In short, about 15-20% of the footage we were achieving in the air was usable in editing. 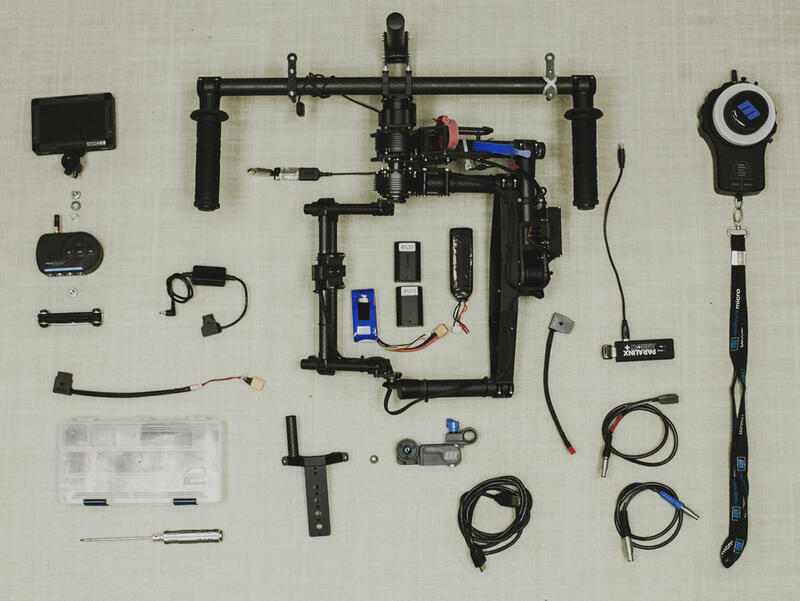 We began hearing about a new style of gimbal system, the part of the rig that actually holds and moves the camera. This new gimbal was based around brushless motors, taking the pulley-servo combo out of the mix. This promised to smooth out the camera movements, but wouldn’t help us with drifting horizons or vibration isolation. But as with any burgeoning industry, the early adopters will always be happy guinea pigs, eager for those game changing results. We ended up running through a few gimbals, all promising to deliver those results, but ultimately they all fell short in different ways. Then, we heard about the Freefly MoVI. Freefly Systems was a small outfit of aerial specialists in Seattle, WA. They got their start building custom multi-rotor rigs and flying for some of the biggest brands in the world. We had heard rumblings they were working on a new gimbal that would blow everything else away. It would be called the MoVI and it would be bigger than aerial-only application. We couldn’t wait. MōVI BTS from Vincent Laforet on Vimeo. Freefly was shifting from the niche multi-rotor market and broadening their horizons to anyone in cinema with two hands and two legs. In retrospect, it seemed so obvious: take the gimbal off the aerial rig and use it like a Steadicam. But they did it first...and it changed everything. It added an amazing tool to the arsenal of every cinematographer, allowing previously impossible shots (short of Hollywood-level budgets) to be had, relatively easily. The complexity of the technology combined with the simple usability make it my favorite tool in our storytelling arsenal. We mostly use the MoVI as a 3-person setup involving an operator physically carrying the rig, a DP controlling the camera framing and movements, and finally, a focus puller. With this setup, we experience longer coordination times for our shots, but the outcome of that time commitment translates into some of the most beautiful and meaningful pieces we’ve ever created. We find ourselves incorporating the MoVI with the majority of our projects, whether it be one shot or many, there always seems to be a place for it. FanPics from FortyOneTwenty on Vimeo.